The State-side sister shop is unapologetically trying to poach talent after Mother London won Campaign Agency of the Year 2018. If the pay rise doesn’t convince you, access to finest avocados will. Mother London staffers will turn up to work this morning to find a job offer letter on their desk from its sister agency. Executives over at Mother USA have gone poach-heavy after the U.K. branch won Campaign Agency of the Year 2018. Part of the letter reads: "I’ll be honest, the tone and timbre of business over here can be challenging, but that’s why we’re so interested in your extensive experience. "Naturally, we’re offering a noticeable change in your base compensation, but also access to some of the finest avocados in the world, complete with the necessary kitchen implements and edible accessories. There’s also a Hulu account that we all share quite equitably (I can forward you the viewing schedule -- we coordinate so the account doesn’t get flagged)." 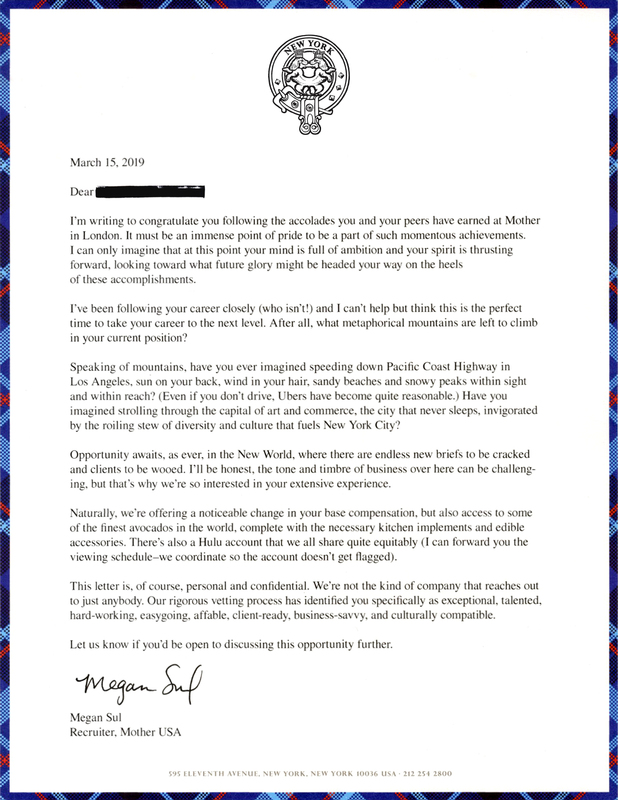 It’s signed off by Megan Sul, "recruiter" at Mother USA -- so you know it’s legit. Paul Malmstrom, creative chairman, Mother U.S., said: "Sometimes when you’re looking for the best, the answer is right in front of you. "There's a magical combination of talent, chemistry and ambition going on in our London office. Is that something that can be imported to the U.S. for the price of fresh avocados? Most likely not, but one has to try new things, even if they seem impossible. 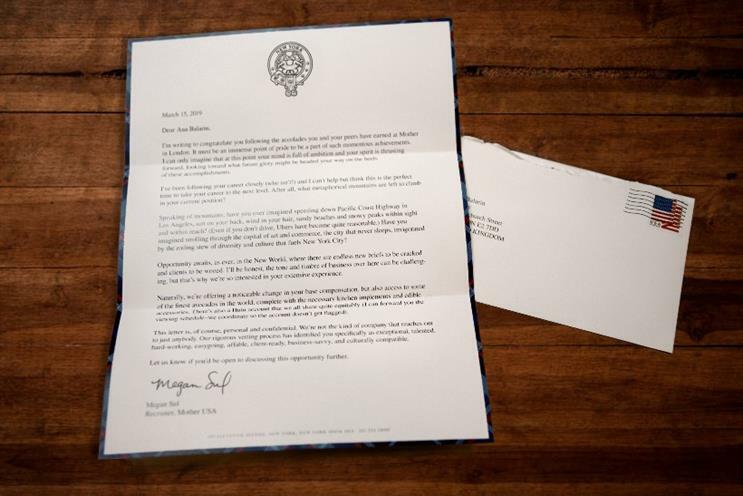 "This letter is a form of advanced trash talking, with equal measures of admiration and a wish for ultimate destruction. Our true human emotions expressed on very fine stationery."